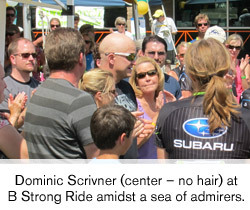 When we met Dominic Scrivner, he was bald – his hair a victim of chemotherapy. Hair, however, was the least of his worries. Husband and father of 3 (plus 2 dogs! ), he was 3 months into a battle with stage 3 testicular cancer and fighting for his life. May 9: Biopsy results: Stage 3 testicular cancer. Shortly thereafter Dominic embarked on a 4 cycle, 21 day-per-cycle chemotherapy protocol. To ride - an audacious undertaking with chemo scheduled to end only 12 days before the ride. “compelled to do what I can”...again, this in the midst of fighting for his own life. That August, Dominic completed B Strong ride. It took everything he had to make it. From B Strong Ride Director Paul Balaguer: At the post-ride ceremony, I introduced Dominic to the crowd and told a small fraction of his story, acknowledging him as both the event’s highest personal donor as well as top fundraiser. I knew I would struggle to do this dry-eyed, and when I looked out and saw tears in Dominic’s eyes, I knew I was done for. I did my best to express our appreciation, knowing I lacked the words to communicate how truly grateful we were for all he had done when he was battling cancer as well. Then, in a moment that still warms my heart, the crowd rose to their feet in an ovation that lasted well over a minute – their appreciation for Dominic, who, amazingly, had personally raised over $20,000.